Time has been conceived mainly as either discrete or continuous, but not widely as a simultaneity of the two. I would like to articulate a new theory of time in which time is reconceived as a ‘raw material’ whose natural state is both discrete and continuous. 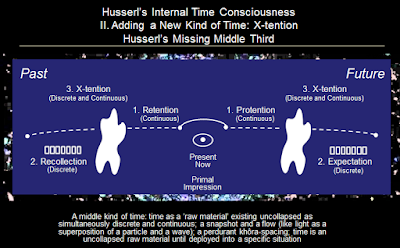 This is a “middle third” position that extends Husserl’s theory of internal time consciousness by being a new form of time in the middle between and connecting retention-protention (which are continuous) and recollection-expectation (which are discrete). What I am naming X-tention is this middle kind of time, existing in a primordial state that is simultaneously discrete and continuous, with the capacity to solidify into either in the case of a specific situation. Time could be analogous to another fundamental physical element, light, which exists in a superposition state of both particle and wave before collapsing into one or the other per observation. 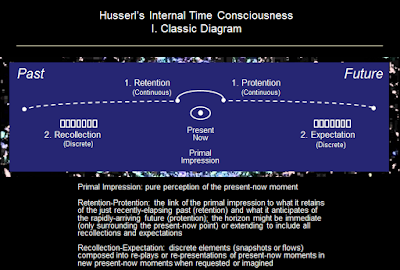 In The Phenomenology of Internal Time Consciousness (1893-1917), Husserl expounds his theory of the structure of time. His core claim is that any present-now moment is comprised of three elements. There is a primal impression, the pure perception of the present now, plus a link to what this perception retains of just-recently past-now moments (retention) and what it anticipates of quickly-upcoming future-now moments (protention). Husserl distinguishes between two kinds of memory, primary memory as retention and secondary memory as recollection. Retention does not break continuity with the present-now moment; it is the part of a temporal object that contemplates its pastness and allows the present to emerge from the temporal background. Recollection does break continuity with the present; the current moment is interrupted to recall and re-represent past memory. Husserl’s theory is depicted in Figure 1. Retention-protention is continuous; recollection-expectation is discrete. Recollection and expectation are piled-up snapshots of discrete past moments and imagined future events. When brought to mind, they are reproduced in a new present-now flow, but exist prior to recall or replay as un-presented discrete elements. The structure of the present-now moment, on the other hand, is a continuous flow of the intentional unity of primal impression and retention-protention. How far the retention-protention horizon extends is unclear. It might only encompass the most immediate recent-pasts and near-futures surrounding the primal impression of the present-now moment, or it might extend to include all previous and future experiences in the realms of recollection and expectation. I posit the conception of a middle third form of time, X-tention, to sit respectively between recollection and retention, and protention and expectation. My addition to Husserl’s theory is illustrated in Figure 2. Whereas protention and retention are continuous, and recollection and expectation are discrete, X-tention as the middle form of time is simultaneously discrete and continuous. X-tention as the middle third conception of time is conceptually similar to light’s wave-particle duality. Like light, the idea is not that time is an either/or kind of a thing. Light is not the kind of thing that is a particle or a wave, light is the kind of a thing that is more fundamentally not either, and may behave like a wave or particle depending on the situation. Likewise, the nature of time could be that it is fundamentally a kind of a thing that is more malleable in its core state, and that may behave as discrete or continuous based on the situation. X-tentive time thus exists as a possibility space where time is simultaneously discrete and continuous, a superposition of the possibility of both until collapsed into a reality situation of one or the other. The metaphor is that of Schrödinger’s cat, which exists in a quantum superposition state of being simultaneously both dead and alive until an observer looks into the box and the state collapses into one or the other. With X-tention too, it is possible to “look into the box,” i.e. ; force the superposition state of dual time possibility to collapse into a reality instance of either discreteness (recollection-expectation) or continuousness (retention-protention). The possibility state collapses into one determination or the other. Since time is a function of the intentional act of meaning, for Husserl, in the case of time, “observing” would be applying an intentional act of meaning. Applying an act of meaning, in the sense of directing intentionality toward an object or objective, would collapse the potential time instance into either retention-impression-protention (continuous) or recollection-expectation (discrete). Why is a middle third position of time needed? It may well be queried why a middle third position of time might be needed. How is it that Husserl did not more explicitly connect the two time regimes? Likewise, while other subsequent thinkers of time such as Heidegger and Derrida have critiqued many aspects of Husserl's theory, they essentially adopted wholesale the time structure of continuous retention-impression-protention and discrete recollection-expectation. However, I think that the discrete and the continuous are too disjoint, and do not seem to connect closely ontologically, methodologically, or practically to each other. Even just the posited structure of time as a binary “either-or” state is an indication that these might not be the only states, or that like light, the more foundational nature of the phenomenon is such that discreteness and continuousness are merely proximate behavioral dimensions of a more profound underlying phenomenon. Conceiving of time as simultaneously both discrete and continuous might also more closely correspond to the real-life phenomenological experience of time, which can seem to be both simultaneously snapshot and flow in the course of lived experience. Moreover, this is congruent with the Husserlian project of phenomenology, describing “how” things are experienced, not “what” is experienced. In summary, the concept of the middle third term of time, X-tention, is simultaneous time duality, where one of time’s properties is discreteness versus continuousness. "Raw time" or "pure time" exists simultaneously in a superposition of both states before an intentional act of meaning collapses it into one or the other state. X-tention can be seen as a perdurant (e.g. ; temporal object-based) temporality of complexity because indeterminacy (as non-determinacy) is a key property. A temporality of complexity is important as we are now starting to have the understanding and technological tools to approach reality in the more nuanced manner of complex systems (non-linear, dynamic, emergent, open, unknowable at the outset, interdependent, self-organizing) as opposed to situations of simple linear causality. I am positing the case of light wave-particle duality as a metaphor, not necessarily as justificatory grounds for my conjecture of a middle third designation for time. Just because duality is true for light does not mean that duality would be true for time. For one thing, matter, energy, and light are one class of physical phenomena, while space and time are another. Matter, energy, and light are ‘what is there,’ while space and time are the composition of the background. It is not that light is grounds for time, but it could be that many or even all physical phenomena ultimately turn out to have a property of duality or multiplicity. At small enough scales, many phenomena in physics might have a duality or multiplicity of states and behaviors, or more broadly indeterminacy as a general property that collapses from possibility to actuality per certain conditions. The presence of an observer is also a dynamic that is not yet fully understood. Matter, energy, and light are inter-translatable per Einstein’s equivalency of E=mc2, and thus perhaps all subject to wave-particle duality in some sense. The conceptualization of time as simultaneously discrete and continuous is an under-explored notion in the philosophy of time, but is enjoying some degree of investigation in physics. One interesting paper notes that information is a quantity which is both discrete and continuous, where time and other physical phenomena might be reconceived as simultaneously discrete and continuous with an information theoretic formulation. The specific calculation involves Shannon’s sampling theory, which is essentially scaling any ‘analog’ phenomenon down to a digital’ formulation, and translating between the two. Another theory, loop quantum gravity, also holds that time might be simultaneously discrete and continuous at small enough scales, like the smallest scale, the Planck length (1×10−35 m). Nanotechnology, the precise placement of atoms in positional nanoassembly as a comparison for example, takes place at the (1×10−9 m) scale. At the Planck scale, fundamental building blocks of spacetime might be composable like Legos into different spacetime fabrics, such as those of “regular” baryonic matter, dark matter, and dark energy.